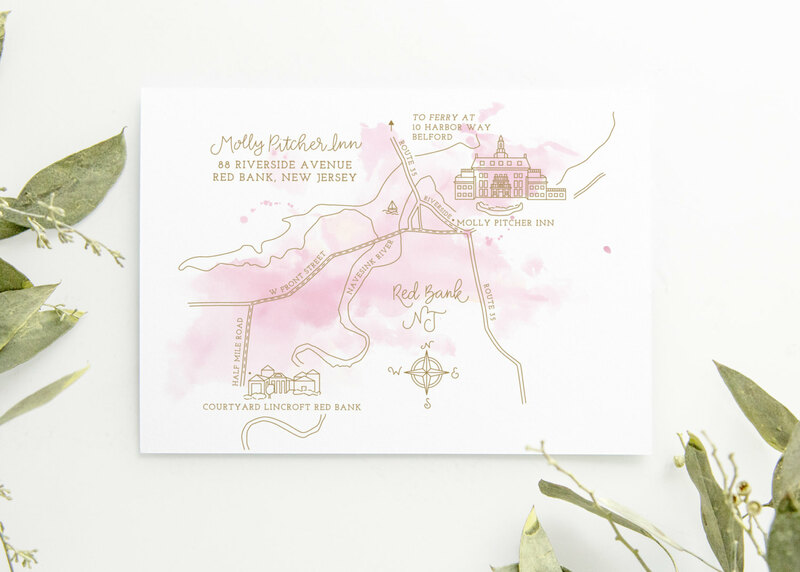 View cart “Custom Ink and Watercolor Wedding Map” has been added to your cart. Adding a custom wedding map to your invitation suite is not only practical, but also a gift of art for the recipients. These completely custom maps are illustrated based on real images of the landmarks. The example shown was printed using letterpress on the illustrations and digitally printed watercolor. Included in this listing is the digital file only – letterpress or digital printing is an additional fee. Included in your purchase are 3-4 detailed drawings of locations and landmarks. I rely heavily on google images and google maps for details of these locations, so if a street view or online images are not available, the drawings may not be accurate (you may provide your own images of the locations). In addition to the detailed drawings, you may label up to 10 other landmarks. You may also include details such as your names and wedding date if desired. If you have any questions or concerns about what can be included, please reach out to me via conversation or email etsy@erinniehenke.com. I am happy to accommodate additional requests. The price of this listing includes a LARGE RGB .tiff file for your map that can be printed up to 40" wide without losing quality! If you need a smaller size or different file formats, it’s no problem. I can even communicate directly with your stationery designer to get them the file they need, if interested. Included in your purchase is one fine art print of your map, 5×7 size. Your fine art print will be printed on 350gsm museum quality paper with no optical brighteners using pigment inks, making this a giclee print. Please enter both your shipping address and email address carefully! I am also available to print these maps as enclosure cards or in welcome bags for your guests at an additional cost. I print on your choice of high quality cotton, shimmer, or linen paper for an additional cost. A typical size for invitation enclosure cards is A2, which begins at $2/each for low quantities (bulk discounts available, minimum order 25). Next steps? After purchasing, you’ll be sent a survey to fill out to help me get started on your map! Be prepared by choosing your detailed drawing choices and additional landmarks, as well as the route you’d like guests to take between venues. I am SO SO SO SO happy with the save the dates Erin made for my wedding. The entire process was an absolute pleasure. Erin is honest, upfront, on time and genuinely cares about the project. She had wonderful ideas and the final product was even more beautiful than I'd hoped. Fingers crossed that every wedding vendor I interact with will be as wonderful as Erin. I had a custom map of my destination wedding location in Italy made by Erin and it turned out so beautifully! She was a pleasure to work with, listened to my suggestions and always gave a ton of options. Would purchase from her again!